A patio door installation isn't the easiest job to do on one's own, but with a few helping hands, some carpentry experience and some attention to detail, it can prove well worth the time and effort. This job takes the better part of a day and experience with tools is required. Home improvement stores carry a wide selection of patio doors and there is an endless number of online sources, so finding the right door for your home may require some patience. 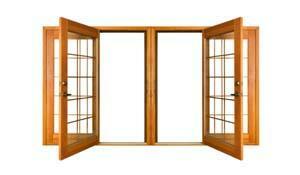 When choosing the door, you will need to consider the size and insulation rating. Installing a patio door that has thermally insulated or Low-E coated glass is important if you live in a cold weather climate. Not only will the glass help keep the heat inside your home in winter, it will help block the sun's heat from entering in the summertime. Sliding-glass doors and French-style patio doors are also available. Before you get too attached to them, double check that you have the space to install a wider door, and room within your budget as they are quite a bit more expensive than a single-framed door. Measure the opening prior to purchasing the patio door to ensure you get one that fits as perfectly as possible. Measure the width and height of the opening, and the diagonal in both directions. The opening should be about a half-inch larger in both width and height than the door you are installing.It's also very important to measure the thickness of the wall. If the wall is thicker than five and seven-sixteenths inches, an extension jam kit may be required for the installation. Double check your patio door for any imperfections or damage that may have been caused by transportation, and make sure all the accessories came with it. Double check that the door that was delivered opens in the direction you specified, as well.Remove the packing and the nailing fin from the sides of the door. The nailing fin is the thin metal sheeting that extends up the sides of the door. Set the door into the opening from the outside to test the fit. Have someone support the door outside, while you check the gaps between the wall and the door inside. If the gap is wider than one inch on any side, fill the gap with a wood spacer, but leave a quarter-inch of space to allow for shimming. Remove the door after taking your measurements. Flashing the wall properly adds an extra seal that helps keep moisture from getting inside the home or between the walls. Start the flashing installation at the bottom of the opening and work your way up. The flashing must overlap at the base to prevent water from being channeled under the door and into the home. Apply the header flashing last and apply silicone sealant all the way around the flashing to help seal the door into the opening. Set the patio door in the opening again and insert wood shims around the door as directed by the manufacturer's instructions. Insert wood screws through the jam at the top and bottom of the door and use a straight-edge level to check the jam for a bow. Hold the level up against the inside face of the jam and look for any gaps between the jam and the level. If a gap is visible, adjust the shims or add additional ones until the gap is no longer there. Repeat the process at the other side of the jam. Secure the sides of the jam to the frame as directed in the manufacturer's instructions and shim and fasten the door to the header as directed. Triple check the installation, test the door for smooth operation and trim the shims so they are no longer sticking out. The gap between the door jam and the wall needs to be insulated with either fiberglass insulation or a foam insulation product that's designed specifically for doors and windows. If you are using fiberglass, take small pieces of insulation and use a putty knife to position it in the gaps. Do not pack the insulation in too tightly or it may cause operational problems with the door down the road. You can also use fiberglass on the inside of the door and spray foam on the outside for an added layer of protection. Seal the gap between the door jam and the sheathing with a layer of sticky silicone flashing tape. Install the interior and exterior trim and install all of the hardware and/or accessories to complete this patio door installation.